Principals and teachers have been invited to participate by trying out new digital tools and innovative instructional practices, then showing how their schools are leveraging digital learning by posting content to social media using the hashtag #hisddigital. Students are also welcome to join the conversation. Selected students will demonstrate their projects during a Digital Learning Day Expo scheduled for Feb. 11, 2016, at Hattie Mae White Educational Support Center (4400 W. 18th Street, 77092). The expo will take place just before the Board of Education meeting, which starts at 5 p.m. The event is free and open to the public. This entry was posted in Global Education, Special events and tagged Digital Learning Month on February 1, 2016 by HISD Communications. 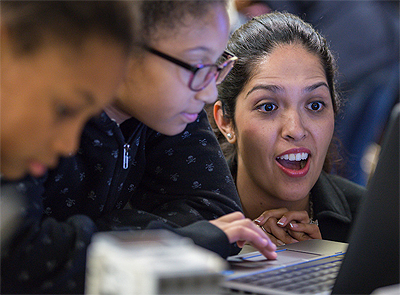 During the month of February, all HISD teachers are being encouraged to try something new in their classrooms, as well as share ideas, resources, and lessons learned by posting their experiences and photos on social media using the hashtag #HISDdigital. Each week during the month, we are profiling a teacher or campus that is using technology to break up rows in classrooms, engage students, and innovate instructional practice. This week’s profile features McNamara Elementary. Earlier this year, McNamara Elementary School teacher Carlos Rosario started videotaping some of his lessons instead of delivering them in front of the class. The result has been somewhat surprising. This entry was posted in District V - Sue Deigaard, Elementary Schools and tagged blended learning, digital learning, Digital Learning Month, McNamara ES on February 25, 2015 by HISD Communications.